What was this place anyway? Want to learn more? Here are some useful links! Questions: How did it work? The Barnum and Richardson Company has been mentioned many times on this website already, and for good reason: Barnum & Richardson owned Beckley Furnace for most of its useful life. There’s a lot more to be said about the Barnums and Richardsons, however, and particularly the Barnum family. US Senator William H. Barnum was not only a principal of Barnum & Richardson, he was an entrepreneur in a golden age for entrepreneurs — so much was it a golden age for entrepreneurs that it is known today as the Gilded Age, and the entrepreneurs were known as robber barons. Here’s a historic document. It’s from the papers of the Henrico Coal Company (in Richmond, Virginia) showing both Senator Barnum and his son, William Milo Barnum, a New York City attorney, as officers of that company. 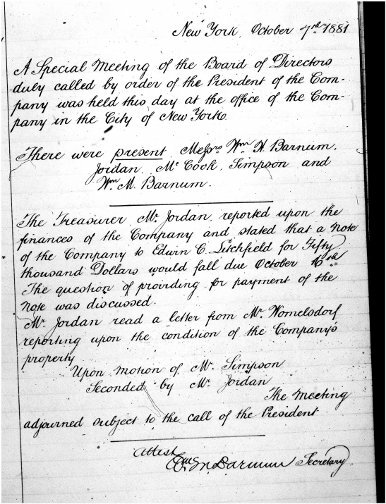 The source of this document is a microfilm of a portion of the papers of William M. Barnum in the Library of the University of Washington — located in the Library of Virginia, in Richmond, VA. Interestingly, another company’s records also appear on that microfilm, the minutes book of the Kanawha Improvement Company (1887-1890), which was actually a railroad company in West Virginia. We’ll be documenting more of these outside connections in future posts. First school visit of the year! Copyright © 2019 Beckley Furnace. Powered by WordPress. Theme: Accelerate by ThemeGrill.